Feel free to check the pre-release or download this A4 Poster, explaining InstantDebriefing in a nutshell. As of December 2016, InstantDebriefing is offering 17 models for you and your team to debrief your team team roles & team dynamics. InstantDebriefing is a catalyst for small-group dialogues. 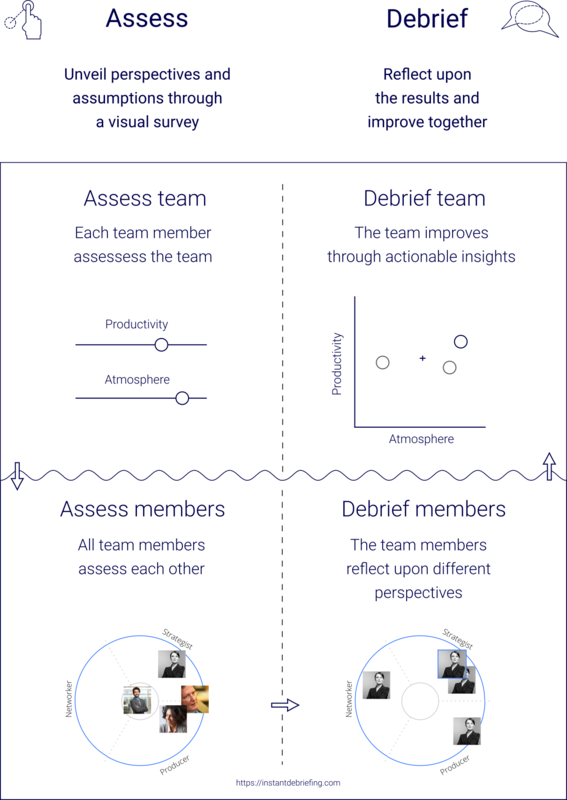 Debriefing roles and discussing behavior enables teams to explore individual assumptions and perspectives within otherwise non-productive, veiled or hidden dynamics. You never know … your team effectiveness might just enhance through an improved individual understanding. In the final days of 2011 my dear coach Hans F. van Aalst passed away. Hans’ inspiration and dedication are embedded in my research trajectory. He helped me to learn. He helped me trusting my instincts. I still remember the moment we met: a tall friendly looking guy, sipping at a glass of red wine at a congress about self-organisation. I walked up to him and we started talking. From that moment on he was a guiding light. We regularly enjoyed lunch in Bunnik, mostly accompanied by sturdy questions from his side.Thank you Hans for balancing the pulling and the pushing. My condolence to family and relatives. In memory of my coach, Hans F. van Aalst, † 30 december 2011. How can visualization help us grasp the nature of our complex relationships? Ecology; interaction between animal or plant species, or individual organisms, that are attempting to gain a share of a limited environmental resource. Economics; the formation and operation of cooperatives. 3 (intentions) Logic; conceptions formed by directing the mind towards an object. archaic the selfish pursuit of one’s own welfare; self-interest. a legal concern, title, or right in property. HINT: Go to default ‘find’-page and use strings like “[? ]” (without the quotes) to find all my questions, or “[! ]” to find all highlights.